Gets a well deserved refresh. I am not sure what possessed me to paint this room flesh pink and dark brown ten years ago? Add to it, the ye olde photos of my family members… a little creepy. 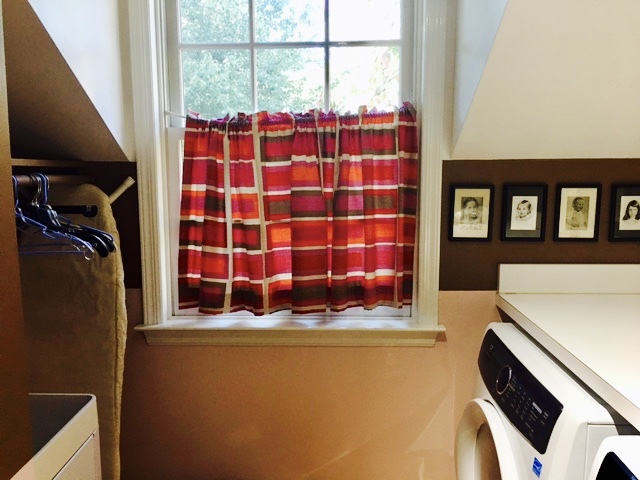 When our washer and dryer BOTH died the same week, I decided it was time to seize the opportunity and give the laundry room a quick refresh. This was a serious budget job, so I will take you through each step. First – paint the walls, trim and ceiling. I had enough leftover Benjamin Moore “Stonington Gray” for the walls and white trim/ceiling paint from last November when I updated my daughter’s bedroom. Paint = FREE. Painters = $300. Down came all of the pictures and nail holes filled because my goal was a much CLEANER look. New Glass Knobs = FREE. They were found in a drawer. The White Wooden Box = $12.00. Only there to cover up the outlet that looks weird with the cut-out backsplash and to hold single socks that end up alone in the dryer. The old window curtain had to go. So did the bent curtain rod. New Curtain Rod = $5.00. Mismatched hangers, cumbersome ironing board and old wastebasket…. GONE. One box of 50 Gray Hangers = $20.00. New mini ironing board (still en route) = $35.00. New Wastebasket = $15.00. Dash & Albert indoor/outdoor carpet runner = $135.00. An indoor/outdoor rug is great for laundry room spills, humidity – basically anything wet! Orchid = FREE, moved to laundry room from family room. Floral painting to cover the exposed hoses/electrical = FREE, found in the guest room closet.